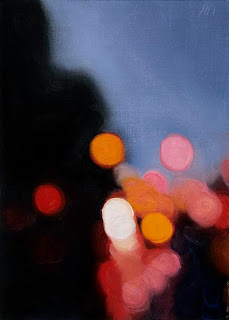 Rouge Reflections, oil on linen panel, 7"x5"
Citylights #31, oil on linen panel, 7"x5"
Number 31 in the Citylights series of paintings. 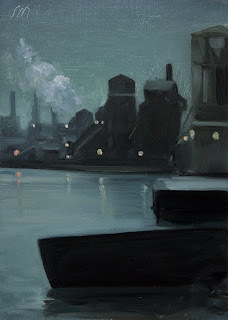 Rail Yard at Dusk, oil on linen panel, 7"x5"
View at dusk of the old abandoned Michigan Central train station rail yards. 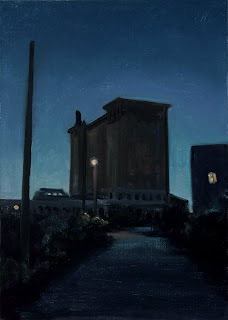 Michigan Central Nocturne, oil on linen panel, 7"x5"
Nocturne of the old abandoned Michigan Central train station. 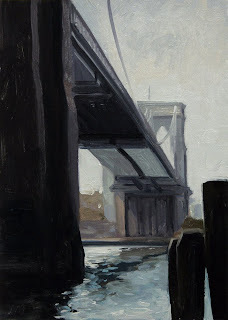 Brooklyn Bridge, oil on linen panel, 7"x5"
Summer Shadows, oil on linen panel, 7"x5"
Summer evening shadows and warm light. 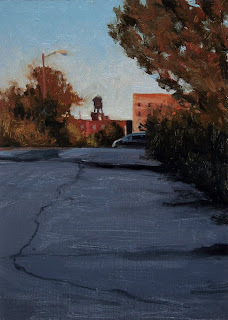 This area is near the Mi Central Train Station. 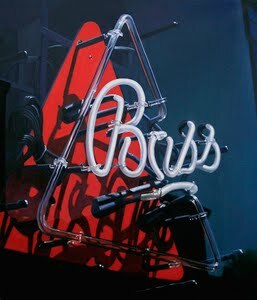 I had just shot photos and was suprised with this composition in front of me. 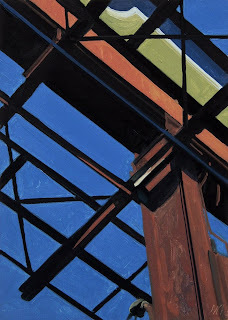 Under a Giant, oil on linen panel, 7"x5"
A very abstract view of a giant billboard next to the old Tiger's Stadium. 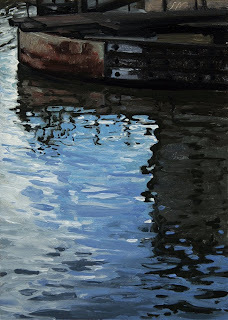 It was late afternoon and the colors could not be resisted. 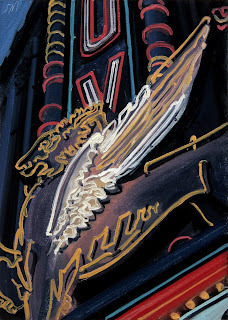 FOX Theater, detail, oil on linen panel, 7"x5"
The FOX Theater is one of six "Temples of Entertainment,” developed in the 1920s by movie mogul William Fox. 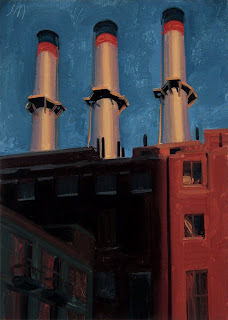 Rouge Steel Noctrne, oil on linen panel, 5"x7"
Passing Storm, oil on linen panel, 5"x7"
Smoke Stacks with warm evening light against dark blue clouds after a clearing storm in downtown detroit. ARTIE, Our new studio cat. He is a real sweetie. 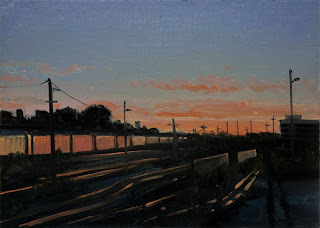 Evening Glow, oil on linen panel, 5"x7"
Evening lanscape near the old train station. 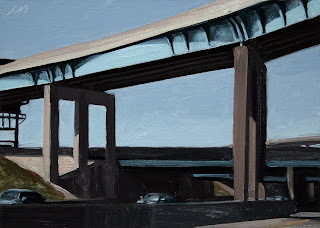 Downriver Bridge, oil on linen panel, 5"x7"
Downriver Bridge to Zug Island. Zug island is a large industrial complex. 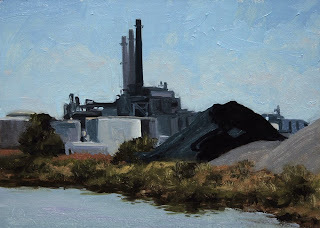 Rouge Landscape, oil on linen panel, 5"x7"
A River Rouge industrial landscape. 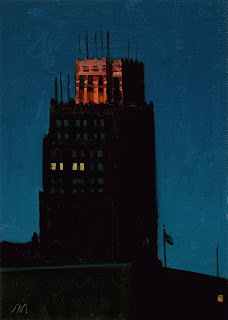 Detroit Nocturne, oil on linen panel, 7"x5"
Detroit nocturne with the David Stott Building. 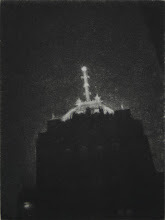 One of many beautiful 1920's skyscrapers in Detroit. 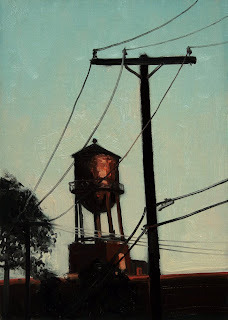 Built in 1929 by Donaldson & Meier. 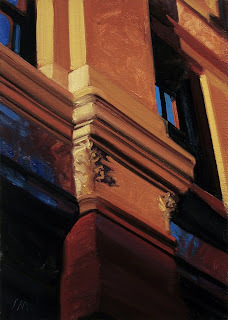 SOHO Reflections, oil on linen panel, 7"x5"
Column Detail, Mi Central Train Depot, oil on linen panel, 7"x5"
An exterior detail of the Mi. Central Train Depot in late afternoon sun. 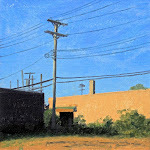 I really liked the very warm light playing against an electric blue sky. 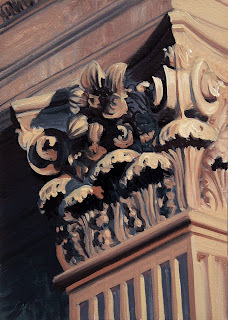 A column detail of the Mi. Central Train Depot in late afternoon sun. 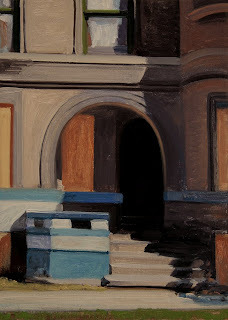 I really liked the very warm light playing against the cool blue shadows. 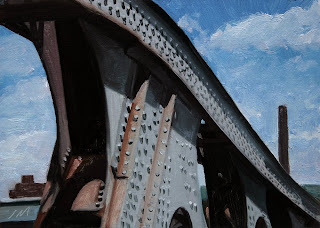 Rouge Bridge, detail, oil on linen panel, 5"x7"
The Jefferson Ave. bridge over the Rouge River. 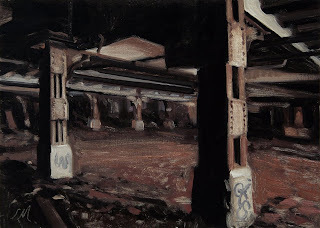 Michigan Central Depot, oil on linen panel, 5"x7"
The Michigan Central Depot, to get into the train station you enter in this area and pass thru the darkness to get to the corridors that take you into the main waiting room. 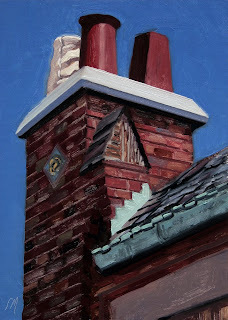 Pewabic Pottery, oil on linen panel, 7"x5"
The Pewabic Pottery was built in 1907 by Stratton & Baldwin. 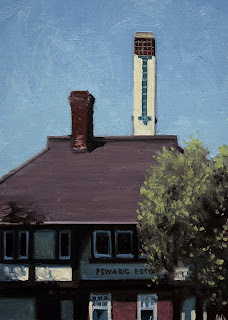 Pewabic is still in business today, and is one of the most respected in the country. 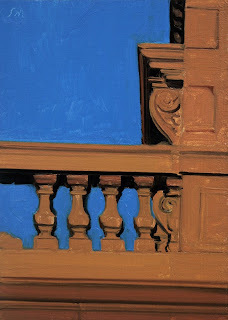 The Granwood, oil on linen panel, 7"x5"
The Granwood is an apartment building just off Woodward Ave. 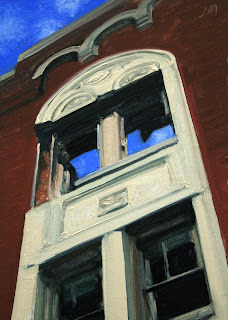 The blue in the windows is the sky and not a reflection. 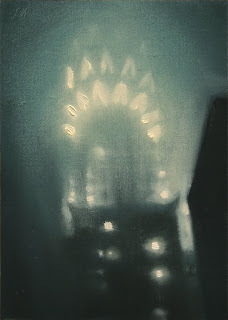 Chrysler Building Nocturne, oil on linen panel, 5"x7"
Nocturne of Chrysler Building in fog. 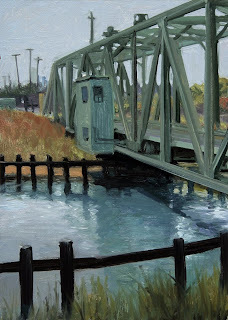 I will be doing a few New York paintings with the Detroit paintings, until I can figure out if I want to start a second blog for New York and other locations or to just add them to the Detroit blog. 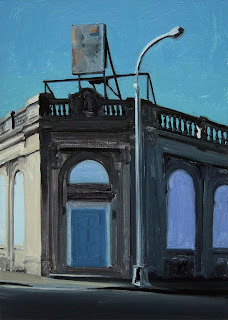 Crossroads, oil on linen panel, 5"x7"
Detail, Brown's Creamery, oil on linen panel, 7"x5"
This wonderful building is no longer a creamery but is still in use..
Brush Park Arch, oil on linen panel, 7"x5"
This archway is part of an apartment building in Brush Park. 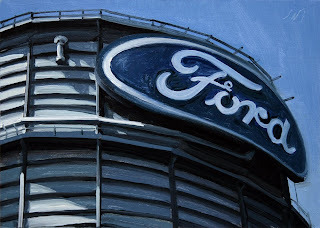 Ford Blue Oval sign, oil on linen panel, 5"x7"
The famous Ford Blue Oval on a storage tank at the Ford River Rouge Complex. 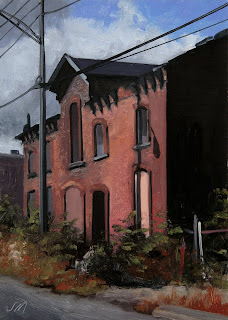 There are so many buildings like this one scattered all over the Detroit area. 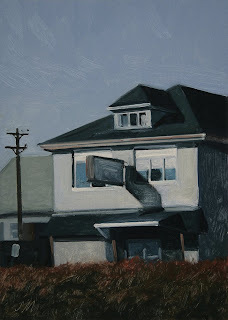 The Carriage House, oil on linen panel, 7"x5"